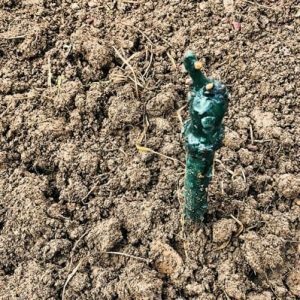 Good news for fans of our summer ready Rose – we have planted even more vines! There's good news for fans of our summer ready Rosé this week as we finish planting our latest additions to the vineyard. What could be better than spending a beautifully hot, summers day with a refreshingly cool glass of wine in your hand? Perhaps that is why our Rondo Rosé has proven so popular since our first release in 2015. So popular in fact that we have extended our Rondo vine area to bring you more summer ready Rosé very soon! Have you ever wondered how a vine starts off on its productive lifelong journey? Below is a brief description of how our team have planted more vines. I don’t think I know a single person who enjoys digging holes, do you? And when there are so many to dig it really helps to have some machinery to give a helping hand. 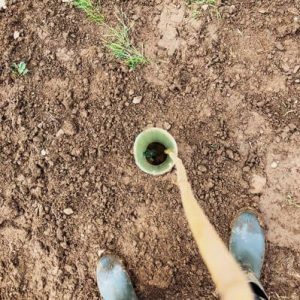 Where as the majority of jobs in the vineyard are carried out by hand by our family team, digging the holes is made a great deal easier by using an auger on the back of the vineyard tractor. 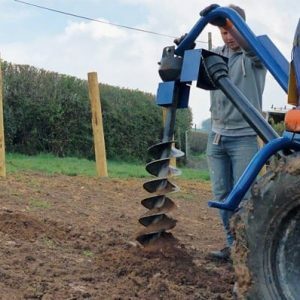 The auger drills the hole, like a corkscrew, loosening the surrounding earth and providing a perfect bed for the new vine to flourish in. The vine itself has a bit of a trim before being buried, with only a few inches of roots being left on the plant. This encourages fresh growth and makes directing the roots easier. 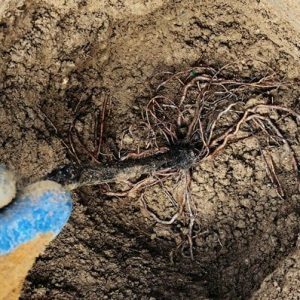 Vine roots are incredibly persistent, and will grow in whichever direction it is planted therefore it is very important to position the roots facing down into the ground. We form a mound in the hole to position the vine over, before burying the roots. The roots are then covered and watered before the hole is filled and compressed with our hands. Our vines are usually grafted onto disease-resistant rootstock which makes them much stronger in fighting diseases which could damage or kill the vine. The graft is found under a waxy coating which is used as protection in transport and to prevent the graft from drying out. The new shoots simply push through the soft wax and the remaining wax disintegrates over time. Once planted, a bamboo cane is added to train the new growth, as well as a rabbit guard to keep the local wildlife from enjoying the new leaves which will form. After a few years, with enough new growth the cane and pouch can be removed as most of the growth is found higher on the vine out of reach of rabbits and other creatures. By joining us on a tour this summer you will have a rare opportunity to see vines in the vineyard at all stages of development, from some just months old, up to nearly 10 year old vines. Our passionate team love nothing more than guiding you around the vineyard and describing how it all works. Plus, to top it all off, you finish your tour with a tasting of our latest wines in our on site shop.